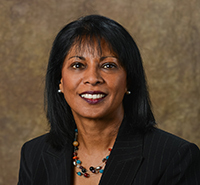 Priscilla Dass-Brailsford, a native of South Africa, is chair and Professor in the International Psychology program at TCS. In the recent past she was an Associate Professor at Lesley University's Division of Counseling Psychology in Cambridge, Massachusetts, and a research faculty member in the Department of Psychiatry at Georgetown University. She studies the effects of trauma, specifically community violence, and other stressful events and is interested in whether individuals from historically oppressed or stigmatized groups experience unique stressors or exhibit culturally specific coping processes. Dr.Dass-Brailsford has several ongoing research projects on ethnocultural violence, community violence, and disasters. Prior to moving to DC, she taught for several years and coordinated a Community Crisis Response team for the Victims of Violence program at Cambridge Health Alliance in MA that responded to affected communities in the aftermath of violence and trauma. Besides numerous other publications, she is the published author of two books: A Practical Approach to Trauma: Empowering Interventions (2007) and Crisis Disaster Counseling: Lessons Learned from Hurricane Katrina (2009). Dr. Dass-Brailsford has presented both nationally and internationally.